Initially built by the Society of Jesus in 1617 and completed in 1626, the Fortress of Our Lady of the Mount of St. Paul is widely known by Macao residents as Mount Fortress. Located in the middle of the Macao Peninsula, the Fortress stands atop a hill that rises 52 meters above sea level and is adjacent to the remains of St. Paul’s College. The top platform of Mount Fortress features Mount Fortress Garden, and is one of the major attractions of Macao, offering a panoramic view of the landscape of the peninsula. Occupying some 8,000 square meters, the fortress is established in the shape of a trapezoid with an average side length of around 100m. The four corners of the fortress protrude to form bulwarks. The northeast, southwest and southeast walls are built on 3.7-metre-wide granite bases. The walls, 9 meters high narrowing upwards to 2.7 meters wide at the top, are made of solid rammed earth, and further strengthened by a thick stucco of ground oyster shells. The parapets were crenulated for the installation of 32 cannons and the two corners of the southeast wall have watchtowers. The walls facing the Chinese mainland are primarily built of granite and do not consist of any battlements, indicating that the fortress was built only for defense against attack from the sea. This military architectural concept represents a clear sign of friendship towards the Chinese authorities of the period. The main entrance of the fortress is located on the southeast wall with bungalows on the two sides behind the gate that were once utilized for military purposes but are employed today as tourism facilities. The fortress can be accessed via a short winding path leading to a spacious platform at the top. In the past, both the platform and the space below were equipped with military facilities such as an ammunitions depot (now Macao Museum Gallery) and a cistern (now Inner Harbor Exhibition Area of the Macao Museum). Throughout its four-century history, the fortress has continually been restored and reinforced, with its inner architecture renovated several times. Originally, the entrance of the fortress was utilized as a powder magazine; in the centre of the top platform a 3-storey tower (no longer existing) was fitted with cannons on each floor. Four rows of houses served as military barracks nearby. Stone steps on both sides of the dormitories connected the entrance to the lower floors. The fortress was also equipped with wells and an arsenal that held sufficient ammunition and supplies to survive a two-year siege. The fortress was a restricted military facility until 1965 when the barracks were converted into a weather observatory. It opened as an attraction site in 1996 when the observatory moved their operations to Taipa. The fort ramparts and walls were restored in 1992, 1993 and 1996, respectively. The restoration involved only repairs and reinforcements necessary to maintain the authenticity of the site, including cleaning well-preserved walls, clearing weeds on the surface and clearing plant roots using herbicides, and mending cracks in the walls with original materials. Given such efforts, the structure of the fortress has been fully retained. In September 1996, the government established the Macao Museum at the former address of the Observatory. The Museum was duly launched for use in 1998. 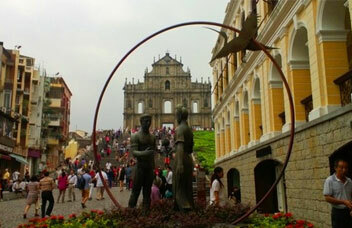 In July 2005, the Historic Centre of Macao was inscribed on UNESCO’s World Heritage List. 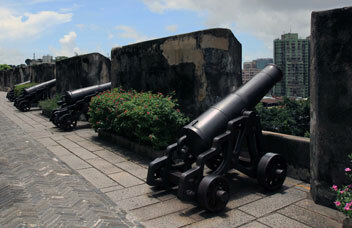 Mount Fortress is one of the important historical architectural structures included in the Historic Centre of Macao.